(Interfax – MOSCOW, June 18, 2013) Chairman of the State Duma’s International Affairs Committee Alexei Pushkov of the United Russia faction said Russia and China’s position on the Syrian settlement marks an important stage in global politics. “Russia and China’s common position on Syria is seen in the West as a disappointing misunderstanding. 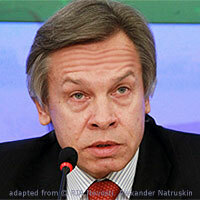 But in fact, it marks the beginning of a new, non-American world order,” Pushkov wrote on Twitter on Tuesday. Deputy Foreign Minister Sergei Ryabkov said earlier on Tuesday that the G8 leaders could do much more in order to bring the Syrian opposition forces to the negotiating table.